WRITER’S NOTE: “(pause)” – unless otherwise noted – represents Randy, the unseen character, speaking. Pauses can vary in length, depending on Randy’s response, as decided by the director/actor. LOTUS, 7, sits at a hotel bar. She wears a pale blue, tulle dress that puffs out over the bar stool. The sounds of a wedding in the distance. Hey Randy – can I get another Shirley Temple? No cherry this time. That red dye can’t be good for you. It is pretty, though. The color of ruby red slippers. My name is actually Lotus. I said, “No. They’re not scary, they’re ridiculous. The makeup is flaky and I can see the strings.” But overall, The Wizard of Oz – good movie. A classic. I’m seven. More specifically, I’m seven years, three weeks. Randy, you don’t have to go all “Little Orphan Annie” on me. I can handle myself, ok? This is the fourth wedding I’ve done this season, and can I just say? I am DONE. I’m done. I’m dumping the leftover petals onto the floor, handing in my splinter-rich basket, and ripping off this itchy, cupcake-inspired disaster, until I’m down to my Disney, day-of-the-week underwear. Figuratively. Not literally – I need to stay clothed until I get home. Social norms, you know. I hate being the flower girl. Today, I have walked down the aisle for the last time. They are going to have to find another sucker to be the token cute one. That’s a flower girl’s only purpose, you know: to be adorable. And it’s a ton of pressure. The cutest ones always do something innocent like get lost on their way up to the altar – or start placing petals in guest’s hands and giggling. I’ll admit, I swoon at the thought. It’s so ridiculously *makes super cute sound. * Right? I’m about to speak a truth to you, Randy. Are you ready? The only reason those little girls are so aww-inducing is because they are completely unaware of the fact that they are being exploited. It’s disgusting, really. And it needs to stop. Guess how much I got paid for my last gig? $20 bucks?! Hah! I should be so lucky. I got paid 10. Not 10 dollars. 10 pieces of salt water taffy. It lasted me a quarter of an episode of Game of Thrones. That’s not a lot of taffy, Randy. I’m telling you, it’s hard out there for a flower girl. (pause – no one speaks)(Lotus finished her Shirley Temple). Another. Make it a double. Double the grenadine, Randy. Geez, how long have you been working as a bartender? That’s 4 ½ times the amount of time I’ve been alive. Crazy. I’ve been doing a lot of thinking, lately. Since I turned seven, it’s been a very introspective time, for me. Seven is the age of reason in the Catholic Church. Not that I believe in God, but it’s something to ponder and it begs the question: If I can go to hell, don’t you think I should be paid in real money? Think about it. Do you like weddings, Randy? I can’t stand them anymore. I feel like I’m always watching these young couples jumping into life together – forever. Like my sister – she’s the one getting married today. That poor soul. She’s made a horrible mistake. They’ve known each other for nine months. Tops. And they got engaged after being together for only two months. Can you believe that bull? Two months? It took me two months to settle on a name for my hamster. What’s the rush? Who’s pregnant? The answer is “No one.” No one is pregnant and the tax breaks aren’t significant, so, again – what’s the rush? I don’t understand the appeal of spending your life with the same someone. Sounds boring. If 7 years feels like forever, what will 40 years feel like? I get an ice-cream headache just thinking about it. Are you married? Cool. I like you, Randy. Even if this god-awful piece of clothing is giving me a full-body rash, I’m glad I met you. You make a mean Shirley Temple. Shirley Temple is an actual person? No way. Wow. You learn something new everyday. 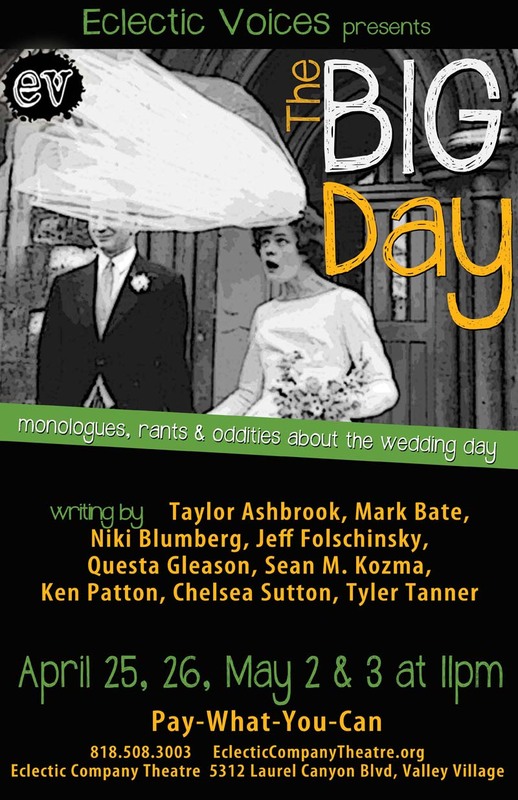 “The Age of Reason” was originally performed by Taylor Ashbrook in the Eclectic Voices Monologue Show “The Big Day” in April/May 2014. Niki Blumberg is a composer, playwright, publicist and collector of all things Sammy Davis Jr. Previously, she served as Associate Artistic Director at Theater 150, Ojai’s professional theatre company, and was the Marketing Manager for A Noise Within, the classical repertory theatre company in Pasadena. Currently, she is a publicist for the performing arts publicity firm, Davidson & Choy Publicity. Her theater works include Love’s Labour’s LOST: The Musical! a mash-up of Shakespeare and the TV show, LOST, which had it’s world-premiere run at Theater 150 in Ojai. At Theater 150, she also recently produced and performed her one-woman concert, Niki Vs. The Piano. In May of 2008, her first full-length musical, The Thorny Kings, a cautionary tale about an extra-terrestrial Jesus, was produced in Boston. Other works include Chardust, a straight play with a secret, and her upcoming musical-in-progress, The Hummingbird Realm. This entry was posted on July 28, 2014 by Eclectic Voices in Monologues and tagged #eclecticvoices, #lathtr, #newplay, #newwriter, monologue, Niki Blumberg.